There was an article about the new permit scheme designed to minimise disruption by giving the council greater control (News Guardian, December 18). Coun Frank Lott is quoted: “An effective highway is a key driver of economic growth, as it connects businesses with their employees, suppliers and customers. We know that unnecessary delays can be a real cause of frustration for motorists.”. In fact, North Tyneside Council is planning the exact opposite in Broadway, Tynemouth. The scheme proposed, and locals have objected to without current success, will Tarmac over three bus pull-ins, resulting in vehicles having to wait while buses stop in the road, and passengers getting on and off. In addition, the 9,000 vehicles a day which use this section of Broadway will be delayed and subjected to an increased safety risk by vehicles turning on and off the main road slower because they have to give way to a new hybrid path. A perfectly valid safer alternative has been proposed by the Tynemouth Safer Cycling Group. 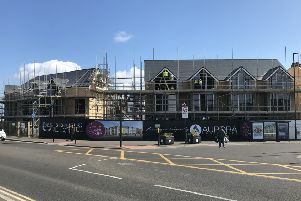 Let us hope it is not too late and North Tyneside Council listens to residents, and to the Department for Transport, which has written seeking further information about the many safety concerns within this scheme.